Last week, an excited group of students stood on the freshly painted sidelines of their new soccer field. As they patiently waited for the ribbon cutting ceremony to begin, you could almost see the plans that they had for this expansive play area, a safe refuge in an often difficult neighborhood. 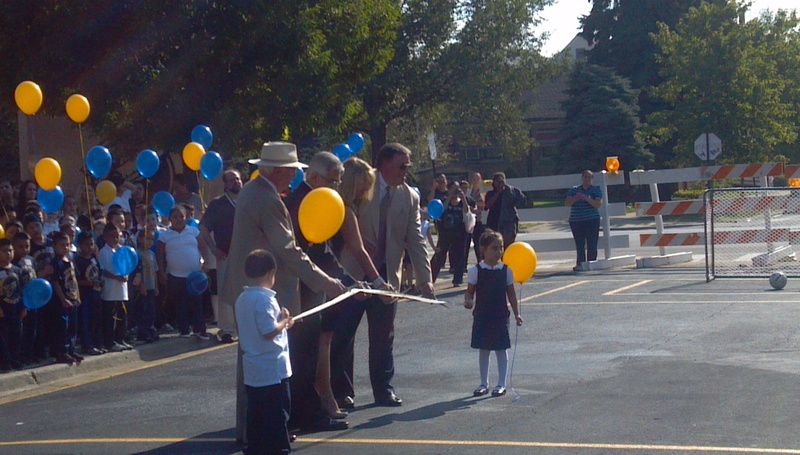 Columbia Explorers Academy is one of the jewels of the Brighton Park community. Columbia serves nearly one thousand students, pre-K through eighth grade. Around 97% of the students are Hispanic and nearly one-third are English Language Learners; just under 10% receive services for special education. Over 98% of the students are considered low-income. Despite these demographics, Columbia Explorers Academy has made huge strides toward success in the ten years it has been in operation. Under the leadership of Principal Barrera, test scores have steadily risen and the school has become the preeminent location for Brighton Park families to send their children. Student awards pile up by the month, including a recent victory in a rain barrel design contest, multiple selections for the Do the Write Thing anti-violence writing project, and ticket art contest winners in an event held by the Kerry Wood Foundation. They have a renowned track team, winning the city championship five times in their ten-year history. They also partner with the Chicago Bulls and the Chicago White Sox for health programs and a Fatherhood essay contest, respectively. Columbia must overcome daily challenges to maintain its success. Gang activity is prevalent and students – particularly older students – are pressured to participate. Because nearly all their students are low-income, the school works hard to provide them with the resources they need to be successful. It is the motivation for a safe and nurturing space that drives Principal Barrera and his staff to go the extra mile for their students. “This is an oasis,” says Mr. Barrera of the school property. In July, during the hottest days of this sweltering Chicago summer, volunteers from Crown Imports spent two days working to create a community park for students at Columbia. They sealed crumbling pavement with fresh, smooth black top, painted line games and a much-anticipated soccer field, assembled new bleachers and created bright landscaping to welcome all members of the community to the park. In addition to all of the outdoor projects, Crown Imports volunteers also made aesthetic improvements with two mosaics, four canvas murals and five sports-themed silhouette wall murals. Most of the students at Columbia Explorers Academy probably don’t comprehend what it took to make all of this happen. They can’t imagine the logistics that went into the planning, they don’t know what it’s like to seal black top in 100+ degree heat. These students aren’t aware that Crown Imports had to make a choice as to whether or not it was worth spending their time and money investing in the community. All these students know is that this year, they have a fun, new place to play. A place that was created just for them by adults they don’t even know. A physical reminder that there are people in this city who care about them, who want them to be successful and believe that they are worth investing in. And in the end, isn’t that all they need to know? 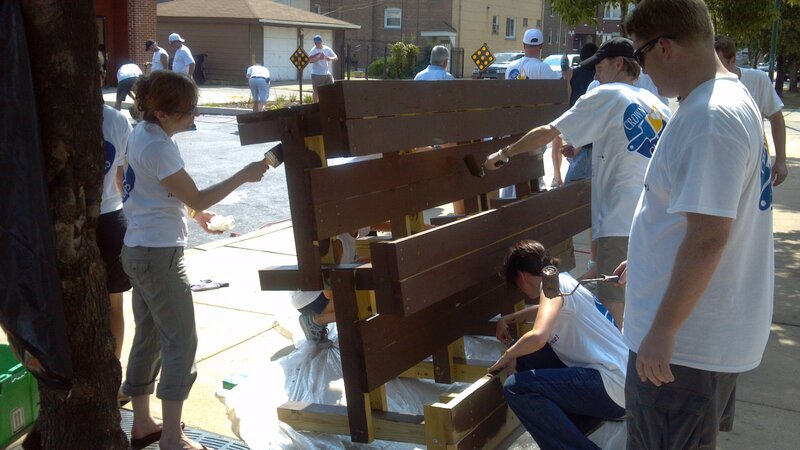 To find out how your company can make a difference in Chicago, visit our Corporate Volunteer Programs page.